I have successfully managed to miss every comet that has passed in my life. Hopefully the 2013 comet survives its trip around the sun. Hopefully the 2013 comet survives its trip around the sun. Make that three. Comet "Lemmon" was discovered recently and is expected to brighten to about 2nd or 3rd magnitude this March. Right now it's about 7th magnitude and visible from the southern hemisphere. The other two are Pan-STARRS which also peaks in March, and ISON in November. This is looking to be a very exciting year for comets! Comet "Lemmon" was discovered recently and is expected to brighten to about 2nd or 3rd magnitude this March. I doubt I'll be able to see it through the light pollution. I usually can't even properly identify M 31 with the naked eye, and I can't get much out of it in a photo before it's swamped by the sky light. The same would probably be true of this comet :/ Anyway, from what I read it looks like a very southern hemisphere comet. For the interested, the full designation is C/2012 F6 (Lemmon). Oh, and I'm also renaming this thread to reflect its relevance to anything to do with comets. Hrm, I made a thread titled Asteroids, meteors, and comets, so maybe either merge the two or just remove the word comet out of the thread there? The discussion over there has been pretty much about asteroids though, so I guess I can just remove the word 'comets'. Plus the thread subtitle says 'everything related to space rocks', so just asteroids and meteors would be more appropriate. 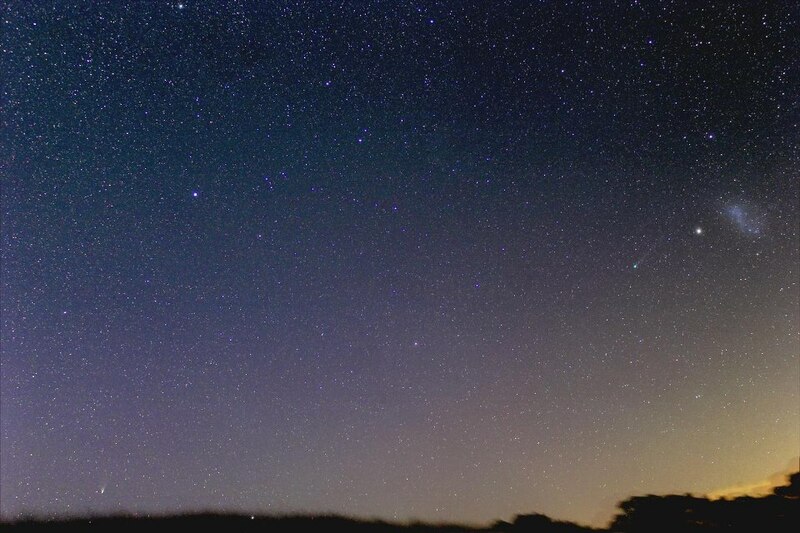 Comet Lemmon is on the right near the Magellanic Cloud, comet PANSTARRS is on the left near the horizon. It's just not fair, when I look up to the sky, I'm lucky to see about ten bright stars if the Moon's not around, that's it. My night sky is the three stars that form orion's belt, that's it. I was kind of happy after Hurricane Sandy (took out all the power except my street's) because I could actually see constellations. I've also been to Yosemite where I got to see the galactic center, at least 5000 stars and I even had my (somewhat crappy) telescope. This is not possible, as there are several brighter stars in the sky, including other stars in Orion. That's a fantastic vid. I love that you can actually see them moving relative to the background stars -- very cool. Well those were just the three I recognized, there were very few (15-20 stars).